Companies that desperately need hot IT skills are ratcheting up salaries and bonuses to lure talented tech workers. Here's how to grab your fair share. "My company went through a split," he explains. "There's such a shortage of top security people, and I was familiar [with the company] and had a good reputation as an architect. It just put me in a really good position at the right time. The two companies got into a kind of tug-of-war salary negotiation with me," says Lorenc, 38. "I actually had an incredible amount of leverage, the kind of leverage you usually don't have without switching companies." His salary may be less impressive than the 30% raise would suggest, he admits. Lorenc came to the original company seven years ago earning somewhat less than the market was paying, but the job is in Montana, where he wanted to live. He believes he could be earning more in other regions of the country. Still, he knows his company values his skills. "I think in a lot of companies, the few bodies that are left that aren't outsourced or offshored have to carry a lot of knowledge for the company, and they become extremely valuable and hard to lose," he says. This year, many organizations are willing to pay for those valuable workers. After several years of slow gains, Computerworld's 2015 IT Salary Survey shows notable compensation increases for IT pros in a range of positions. Average total compensation (salary plus bonus) increased 3.6% in 2015, compared to 2.0% in 2014, according to the survey of more than 4,800 IT professionals. Not surprisingly, survey respondents generally feel better about IT as a career and their long-term prospects for advancement than they have in past years. "Salaries are definitely increasing," agrees John Reed, senior executive director at IT staffing firm Robert Half Technology (RHT). "We're seeing much more movement than we had last year." The firm's own research shows IT salaries growing at just above 4%. Reed says a Texas company in February offered a 50% increase in base salary to two junior-level application developers to entice them to come on board. The offer propelled their salaries from the $50,000 range to $75,000. "That's a huge jump, and one you don't typically see," he says. The hottest U.S. areas for IT salaries right now are Silicon Valley, Denver, Dallas, Houston, San Antonio, Austin, New York and Boston, Reed adds. Other markets coming on strong include Southern California, Chicago and Atlanta. "Salary ranges are moving, and it's very fluid," he says. "In San Francisco, my colleagues say even from 30 days ago they've seen a noticeable [salary] increase in what was already a hot market." No surprise: Money is the biggest motivator for IT professionals when looking for a job or deciding to stick it out with their current employer, according to Computerworld's IT Salary Survey. Nearly half (49%) of survey takers indicate that base pay is among the most important aspects of their current jobs, followed closely by job stability (44%). Of those looking for a new job, 60% were motivated by higher compensation. And 74% of all respondents — not just those looking for a new job — said a salary increase would entice them to change jobs. Good news for them: Companies that desperately need hot IT skills are ratcheting up salaries and bonuses to lure in talent. Sal DiFranco, practice leader for the global advanced technology practice at executive search firm DHR International, says companies are rebounding after years of tight IT budgets and are looking to catch up on skills. "Companies have recognized these huge gaps in the technical expertise they're looking for — software application experience, mobile applications, business intelligence, digital and analytics, and the ability to take those and work with digital marketing teams," DiFranco says. "Then you've got the infrastructure side where you've got to be really strong on virtualization and data center consolidation, and get creative with networking and with network operations centers." IT employees with skills in those areas are "getting good raises internally," DiFranco says, but he notes that many are looking for extra-large gains when changing employers. "They're not going to make a move for an 8%-to-10% [pay increase]. Most of them want 15%, which is a huge jump." One of the best ways to nab a substantial salary increase is to switch employers, says RHT's Reed. (See "In hot jobs market, IT workers call the shots.") "If you want a 20% raise this year, you're going to have a much better chance of getting that by going to a new company than by going to your boss and saying, 'I need a 20% raise,'" he says. One Computerworld survey respondent, a 34-year-old senior design and development engineer in Chicago, pulled off a 30% pay increase over the course of 20 months by changing jobs three times. After five years working for a university, he found his salary stuck at $87,000, and previous raises had gone no higher than 5%. A recruiter found him a position at a tech startup earning $105,000 plus a "guaranteed" 25% annual bonus. "There is a high demand in Chicago for skilled software engineers for Ruby, Python and Java," says the engineer. "I knew the languages and tools" the startup was looking for, he adds. He felt confident that if things didn't work out at the startup, he could easily find another opportunity. The company lasted four months. Two days after his job ended, another recruiter found him a new position making $116,000 plus a $10,000 signing bonus at a technology company. If you have the right skills, the engineer says, "I don't know if you can necessarily punch your own ticket, but you definitely have the confidence to walk in and say, 'I can contribute significantly to this company.'" Employers that are on top of their game have done their research and want to be aggressive when hiring IT staffers with the skills they need. "Typically on the low end they're offering 15% to 20% increases in base salaries," says RHT's Reed. But it's not always worth the hassle to leave a company. "If an employee can get a 10% raise where they are and the market is commanding 15%, it might not be worth it to jump ship for that extra 5% and leave a company, a position or a manager that you actually like," Reed says. That sentiment rings true for a 42-year-old network manager at a college in the Northeast. He got a 3.6% raise this year and is now at $95,000. "I would like to have more money, but when you work in education, it's quality of life versus pay," says the nine-year veteran of the college. "I feel well compensated, and I'm within the pay range [for my skills and experience], but I also get five weeks of vacation a year and seven to 10 holidays." Retaining talent makes sense from the employer's perspective, too. Staff departures cost a company time, money and other resources. Direct replacement costs can reach as high as 50% to 60% of an employee's annual salary, with total costs associated with turnover ranging from 90% to 200% of annual salary, according to statistics reported by the Society for Human Resource Management. That gives companies that can afford it good reason to offer healthy raises to valued employees. 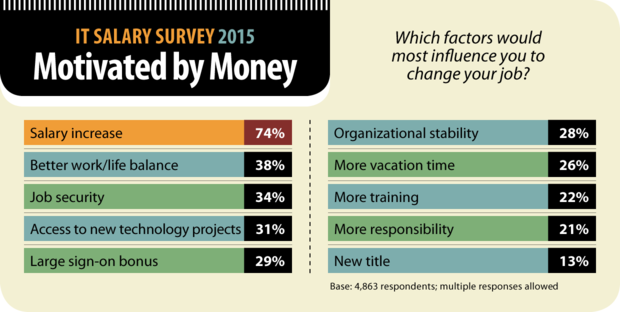 Indeed, of the Computerworld survey respondents who reported base salary increases of 10% or more, just 27% said they changed employers to get the extra money. The rest attributed their pay bumps to promotions, added responsibilities or other reasons. A senior director of strategic accounts at a life sciences technology company in California scored an 11% pay raise based on performance and a 20% bonus based on the business unit's earnings. "Certainly salary is a big part of my job satisfaction; the industry is very cyclical and you cannot rely solely on company performance," he says. The 14-year company veteran has had a steady career climb. He started as senior software engineer and moved up the technology ranks. He then migrated into technical marketing and finally into sales. Discussing the strengths he brings to the job, the senior director says, "When I talk to my clients, I know the business but I also speak the technical language, and that helps very much." Lorenc, the senior infrastructure security architect who got a 30% pay increase after his company split into two, says his broad set of skills helped earn him that big raise. "I'm a security architect who's very broad but very deep, too," he explains. In his seven years total at the original and spinoff companies, Lorenc has implemented or run many security systems, such as application firewalls, security information management tools and a vulnerability management program. He also served as head architect in securing voice and telepresence systems. His biggest project was architecting the network security design for the original company's $22 million data center, which was later split into two for the two companies. His advice to IT pros looking for big raises is to beef up communication with IT managers, business units and company leaders, and be willing to take on challenges. "Be flexible, research those new technologies, and reach out and work across different towers of the business," he says. Despite strong compensation gains overall in 2015, slightly more than half (54%) of Computerworld survey respondents said that they feel underpaid based on their roles and responsibilities — up slightly from 52% in 2014 and 51% in 2013 and 2012. That sentiment may be the result of years of corporate belt-tightening, when salaries barely inched up while IT staffers were asked to take on more responsibilities and heavier workloads. "There are many people who have been hunkered down at their current job, maybe since the last economic downturn, and they don't know what's happening in the marketplace," Reed says. "They might be worth much more than they're receiving." If you're looking for a big raise, it's important to do some research and know what your value is. "Look at job listings online, see in what ranges companies are paying, talk to your peer network — that's where it all starts," Reed says. If, after doing the research, you've decided you're worth more than you're earning, try approaching your current employer. "Before throwing yourself out in the marketplace, go to your existing employer, armed with your salary research, and ask for a raise," Reed advises. "There may be an opportunity to get a pay increase where you are." But don't challenge your employer with big demands, he cautions. "Just because the market is paying higher than you're making doesn't mean you're necessarily going to find a new job that pays you that much," Reed says. Issuing an ultimatum "is a huge mistake that has blown up on people many times." The next step, says Reed, is a skills assessment. Identify the hottest skills in the market, the ones that will help drive up your compensation. If your expertise is lacking or outdated, take a course, even online, or get a certification. Nothing — not even training or a certification — replaces hands-on experience in a hiring manager's eyes, he notes. But if a company can't find someone with years of experience and "it comes down to you and another candidate with comparable skills, [a certification] will give you a leg up," Reed says. For his part, DHR's DiFranco sees courses and certifications as a long-term strategy. A new skill certification alone won't impress a headhunter, he says. "A search firm is already bringing in people with three to five years of experience [in a particular skill] to a company," he explains. Instead, he advises IT employees to figure out the newest technologies that their current company needs, then get the appropriate training and ask to be involved. "You're already a proven commodity" at your current employer, he says. "They're going to give you a chance if you have the credentials, more so than someone on the outside giving you a chance." Putting your new skills to work at your current employer will give you the experience you need to compete in the job market — and might land you a raise or a promotion at your current company. If you're really ready to take the leap to a new job, don't just throw your résumé out on an Internet job board — your boss or someone else from your company could see it. "It doesn't take long for someone on the inside to find your résumé posted, and it may backfire on you" Reed says. "Your loyalty comes into question, and you might find yourself looking for a job because now you don't have a job." Instead, tap into technical user groups and professional organizations, participate in networking events, and communicate with IT people who travel in the circles that you do. That's the way to find out who's hiring, what skills they're seeking and what they're paying. "Those are the things that will lead you to better compensation," Reed says. Finally, recruiters or staffing firms can help you find a higher-paying position quickly, says the Chicago-based senior design and development engineer. He used two different recruiters to find each of his last two positions, and he emphasizes that the second recruiter found him his current job in just two days and "was able to get me what I wanted in terms of salary." The IT career outlook is improving from year to year, according to the Computerworld survey. Asked where they expect to be five years from now, 52% of this year's respondents said they anticipate being in higher-level positions, either with their current employers or at new organizations. In contrast, just 37% of the 2014 survey respondents said they expected to move up the ranks within the ensuing five years. Recruiting firms are also cautiously optimistic, expecting the IT labor market to remain strong over the next 12 to 18 months as companies seek to innovate and gain a competitive edge through technology. "They're not backing off their investments in technology, and that's why it will be a pretty solid [employment] picture," Reed says. "You have to have the people to execute it." That means IT professionals have a chance to position themselves for big raises. "In my company, when they think of security, they think of me — I'm their first call," Lorenc says. "Once you're in that position, it gives you a lot of opportunities." Click here to view the full ComputerWorld article.